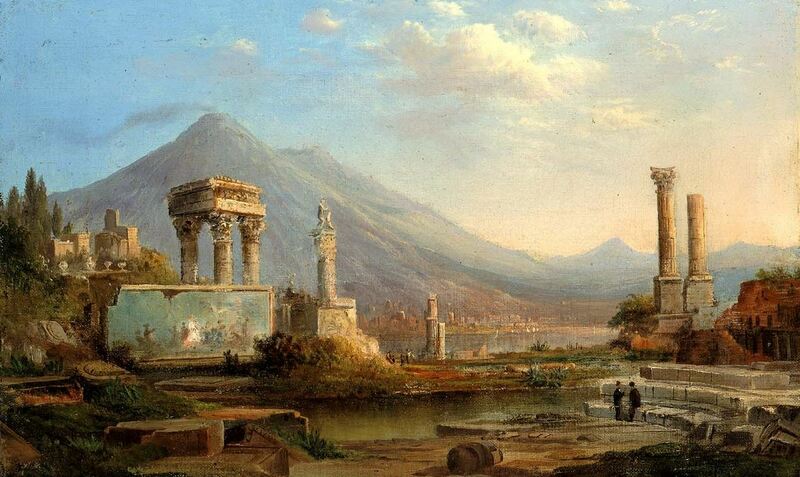 Duncanson’s Pompeii and Vesuvius, 1870. Today marks the death of Gaius Plinius Secundus, aka Pliny the Elder. He died along with 20,000 of his friends and neighbors. On August 24, 79, Mount Vesuvius exploded and Pompeii and Herculaneum were no more.
. . . Pompeii was doing just fine. The town had at least 130 bars, pubs, and taverns. Two hundred restaurants. Thirty bakeries. Good food, beaches, an amphitheatre, bath houses, and regulated, taxed brothels were attractions. People enjoyed a relaxed secular life. “Money is Welcome” was engraved on the floor of a trading house; “Profit is Joy” announced a sign in front of a merchant’s home. Bawdy graffiti and wall advertisements were everywhere, delighting and informing modern archaeologists as much as they did residents in the year 79 when it all came to an abrupt end. The day before the city was destroyed had been a bright, hot, relaxing holiday. It was the Vulcanalia festival, though few people took their religious heritage seriously. The pious might have sacrificed something to Vulcan, god of fire. Many people started the day with the festival’s tradition of lighting a candle; some may have even committed a minor personal treasure to ash. But at the time, Vulcanalia was a day for sports competitions. It ended with a huge bonfire. Tossing live fish into the bonfire was part of the fun, but most people were not so religious. Perhaps if they had realized they were living in the shadow of violent devastation, they may have made more significant and solemn sacrifices to their volcano god. But there was little to link the Vulcanalia customs to the mountain looming on the horizon. Other than a few ancient myths, there was no record of the mountain being dangerous. But in one legend, the Greeks told about Hercules fighting the fire god on Mount Vesuvius, “a hill which anciently vomited out fire.” Nearby Herculaneum was named for the battle that set Hercules against Vulcan; Pompeii, for the pumpe and ceremony, or victory procession, which Hercules celebrated after his victory over the fire god. But these were legends. No one imagined the mountain could explode and obliterate their city. The last eruption was two thousand years earlier. It had destroyed Bronze Age villages, but that history had passed into mythology, and was hardly believable to Pompeii’s sophisticated first-century residents. By August 24, the Vulcanalian holiday was over; people were back at their routines, back at work. Then the mountain exploded. Smoke billowed from the lush crater amid rumbles louder than thunder. At midday, a tremendous explosion blew apart the cone of Vesuvius, sending a plume of ash and pumice forty kilometres into the sky. The power of that single explosion released as much thermal energy as 100,000 Hiroshima atomic bombs. At the volcano, molten rock was launched at a rate of a million tonnes each second. Farther away (but not far enough), ash began to fall like snow on Pompeii. Within minutes, the city centre was knee-deep in warm tephra that began to fuse into tuff. People fled. From relative safety across a bay, in the town of Misenum, the Roman admiral Pliny the Elder received a message that his friend Rectina was trapped at her seaside villa near the foot of Vesuvius. He immediately launched a fleet of galleys for the evacuation of the entire coast. Pliny himself set off with a handful of aides in a light ship to rescue Rectina’s group. He covered the 35 kilometres in a few hours, but as he approached the volcano, showers of hot cinders and pieces of rock pelted his boat. Pliny reached Stabiae, about three hour’s walk from Pompeii but was trapped by falling debris, pumice floating in the water, and winds that kept him from rescuing Rectina. Pliny’s team was stuck; they spent the night on the beach as ash accumulated. In the morning, rocks and wind still blocked their escape by sea. The group tied pillows to their heads – helmets against falling rocks – and withdrew by land. Pliny, in his mid-fifties, sick and weak, decided to stay on the shore and wait for his crew’s return. He died on a white sail that his companions had set out for their admiral. They tried to make him comfortable before abandoning him. The group hiked out of the doomed spot, and returned to Misenum. Their safe return is how we know that while they were still at sea, just before reaching the spot where he would die, urged by his helmsman to turn back, Pliny responded, “Fortune favours the brave.” Death, too, apparently. We know much about Admiral Pliny’s heroic attempt to save his friend and about the manner in which Vesuvius erupted because at the villa of Pliny the Elder were Pliny’s sister and her bookish teen-aged son, remembered by us as Pliny the Younger. Much later, the junior Pliny wrote to his friend Tacitus that his uncle was likely killed by poisonous sulphurous gases. However, gases did not affect anyone else so it has also been speculated that the admiral suffered either a stroke or an asthmatic attack. At the villa in Misenum, Pliny the Younger was taking notes on what he could see across the bay. He had been invited to join the rescue party, but he was a bit sickly, only 17, and he was no fool. His motto could have been fortune favours the cautious, as Pliny the Younger would live a long successful life navigating the intriguing labyrinth of Rome’s power, becoming wealthy and popular in the process. He not only survived the rule of various (and frequently contradictory) emperors, but consistently rose in rank all the while. Pliny the Younger matured into a gifted Roman lawyer, author, and politician. He was an incessant letter-writer. His notes are an important source for historians because Pliny illustrated the lives of the rich and famous when Rome ruled the western world. It was his friend, the historian Tacitus, who urged Pliny to put his Vesuvius experiences in writing. Pliny’s description is the world’s oldest written eyewitness account of a volcano. He wrote with such detail that modern volcanologists refer to similar eruptions as Plinian, in his honour. 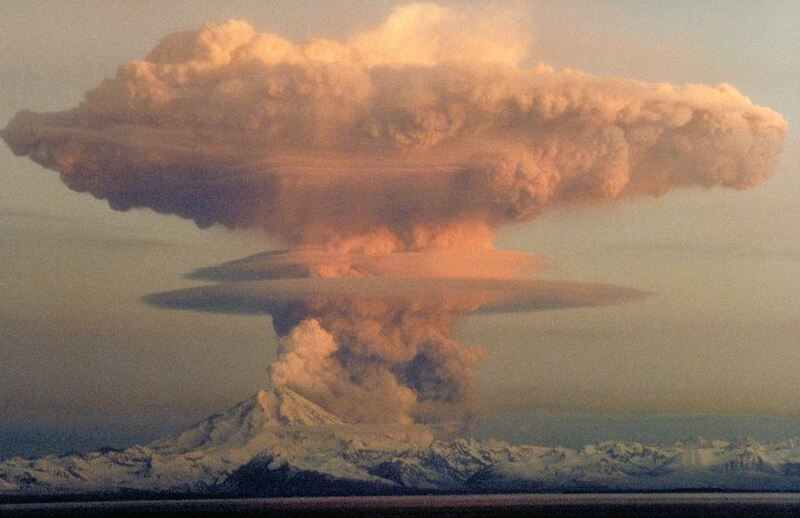 A Plinian volcano – this one is in Alaska, but fits Pliny’s decription of Vesuvius erupting. A Plinian eruption is a volcanic explosion in which columns of gas and ash are blown high into the stratosphere, lifting enormous amounts of pumice. This type usually includes the loud explosive sounds and pyroclastic flows which warned, frightened, then smothered the citizens of Pompeii. This entry was posted in History, Religion, The Book and tagged history, mountain mystery book, myths, Pliny, religion, volcanoes. Bookmark the permalink.